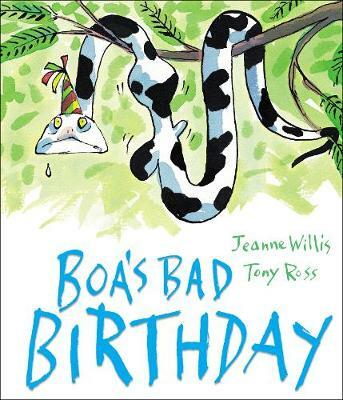 Boa was excited on his birthday just like me but it was not as good as he thought it would be.Each time his friend would come with a gift,he found it was of no use. The smallest gift was most useful. Boa's pictures are cute. Boa got good birthday gifts. Because, this books tells ,you should be nice to others when they give you a book, and you should not underestimate any present by their appearance. I learned when I give a gift to someone I'll give to him something useful . the end is nice and funny. I thought it was unusual. its about a snake who didn't like his birthday presents..and at the end he got a ball of mud as a gift...at first he thought it wasn't good..but there was actually a seed inside it.and it turned out being the best present.. It was fun trying to guess what the gifts were and it made me think about being grateful! I like how it turned out to be the best present for boa!